The media interview, for most people and their organisations, represents the most common form of media facing activity and one of the most challenging. It is an extremely powerful communication medium – if it is managed correctly. That's what our media training course is all about! In the same way that media interviews can take a wide variety of forms - print, radio, television, live and recorded, so too do our media training programmes. All sessions will develop skills and confidence that will enable you to manage this environment to best effect. Media training programmes can be whole or half days, basic awareness sessions through to advanced level sessions, small groups or one to one. All programmes are designed to meet individual requirements and subject matter is real to each participant. 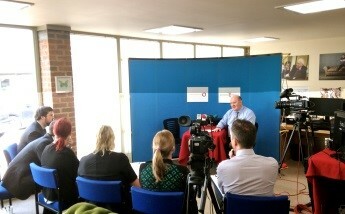 The full day media training programme is built around a succession of interviews in a variety of environments, each followed by playback of the recordings and analysis of performance. Planning methods and how that leads into structure, the use of effective language, dealing with questions and a familiarisation with a range of environments are all covered in a very busy day. Activities can include outside broadcast and studio based interviews, down the line television and radio. Whatever you are preparing yourself or your colleagues for, we can create a realistic simulation for you to practise in a safe environment. Whatever media training programme is agreed upon and designed it will be practical, realistic and conducted as a learning event in a totally confidential manner. All sessions are run by high quality and professional media training tutors with relevant experience and each course is supported by a variety of materials that ensure the learning from the session is long lasting. Just to say a big thank you for yesterday's session which really was excellent. The transformation in terms of the confidence and competence of all 5 participants from the first interview in the morning through to the last in the afternoon was quite astonishing! You put so much work and preparation into it and it definitely paid off with results which were immediately obvious. I read the notes on the train home and they are also excellent. I've worked with a number of different media trainers but your service is without doubt the best I've come across. I hope we can organise another day for some of our senior volunteers early next year. I don't have Rob's email so please pass on my thanks to him too. It was a most productive and enjoyable day!